Dental Assisting is one of the most rewarding careers available! A career in Dental Assisting offers good pay, excellent hours, a happy and upbeat working environment, and is an excellent place for individuals who love to work in a team. 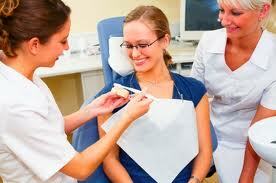 A career as a Dental Assistant is secure for many reasons! Dental Assistants are important to the Dentist because he simply cannot do everything himself! As Assistants, we help the Dentist with suctioning, instrument passing, retracting the tongue or cheeks during procedures, and preparing patients for dental procedures. We also write notes in patient charts, handle the charting for dental insurance claims, and make future appointments for the patients. 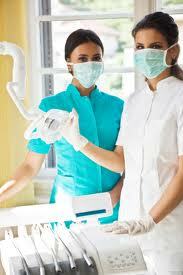 Dental Assistants are important to the patient. 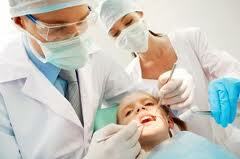 As Assistants, we explain procedures and acquire the patients consent for a dental procedure. We help the patient with comfort in the patient chair and ensure they understand post-procedure instructions. We call the patients in follow-up care and ensure that they are happy and healthy in their dental health. It is important to be empathetic to patients needs and concerns, and to work with them to achieve optimal comfort and satisfaction. Dental Assistants are important to each other. In every dental office, the entire staff work as a TEAM. There are often times an assistant must take extra time to speak to their patient, or may need an extra set of hands to clean the treatment room or sterilize the instruments. As an assistant, each of us looks out for the other and helps when it is needed. As a functioning dental office team, the entire day will run smoothly with everyone helping each other stay on task and on time! Dental Assisting is rewarding, secure, and enjoyable! All of our students graduate with knowledge and skills applicable to the dental field and our curriculum ensures that they are qualified in Radiology for the State of Utah and have the skills necessary to become an amazing Dental Assistant! Contact us with any questions, comments, or inquiries. Visit our website at Practical Dental Assisting today!